I ended the last missive wondering if my Cask Marque Ale Trail score would be 64 or 65. Well I’m delighted to tell you that at the start of tonight’s episode it was in fact 66! A quick old email to info@cask-marque.co.uk got the Harp, which I was unable to scan in last week’s visit, and another pub local to me (not displaying the certificate! Tut Tut!) added to the grand total. 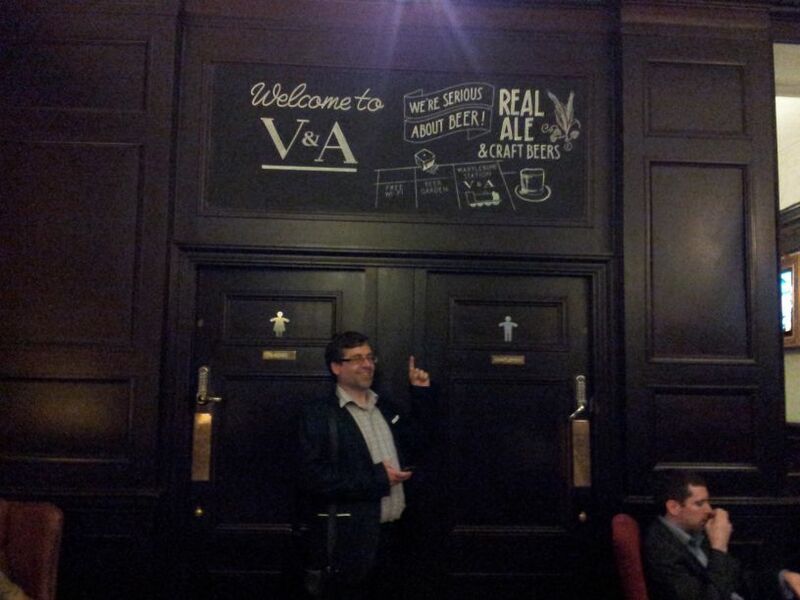 So again it’s big massive Top Hats off to Cask Marque. I had presumed that tonight’s visit would be a low key affair as Marylebone station is quite a way away from the stomping ground we’ve been stomping around lately. But lo and behold the lure of another evening in the company of the BGC proved far too tempting for many of the Monopoly Tour regulars, and it was with the very encouraging entourage of 5 (Charlie, Buddy Rob, Aussie Pete, New Guy Mickey and No Nickname Michael) that we travelled the joys of the Bakerloo line up to Marylebone Tube Station. For our female readers, Spikey haired Ed was in a miff and refused to come along…………..he’ll be back next week, sleep easy ladies, sleep easy. Propping up the post - or the post is propping me up. 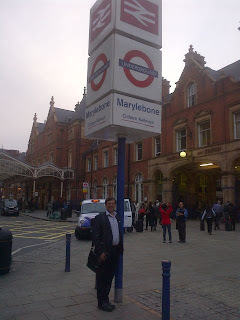 As always I’d planned out the pubs and there were three Cask Marque emporiums to be found in the vicinity of the station, running almost in a direct line running east to west from the station. 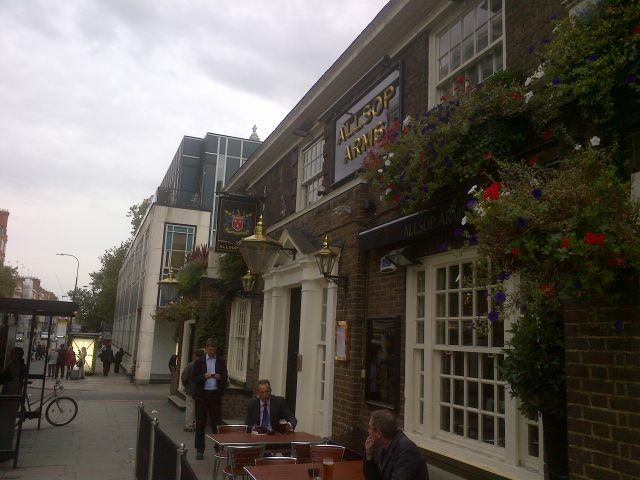 The first stop was Allsop Arms in Gloucester Place which was a short walk turning left out of the station. This is a Greene King pub and felt like a small village hostelry tucked away from the noise and clamour of central London. 5 pints of London Gold and 1 bottle on Bud later we realised we were once again sitting under the loud speaker and sure enough as soon as it turned ½ 6 the landlord must have decided that it was evening time and on came the music again. In slight relief we recognised that he was playing what seemed to be an 80’s mix tape but again we were driven away early into the evening to find the next and hopefully quieter place. 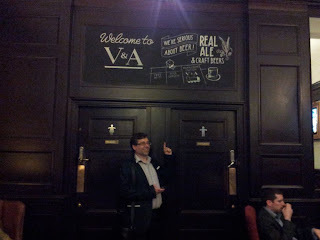 Allsop Arms - Buddy Rob checks the beer range before entering. But before our departure we’d easily located the Cask Marque certificate displayed on a column next to the bar but once again I and my useless phone had to do the merry old dance of trying to find a good enough connection after scanning the certificate. Aussie Pete came to the rescue in a rather geeky but good way by “tethering” my phone to his which was then acting as an access point………………………yeah right. All very sad and boring but it did allow me to get the scan and did allow all the others to make various hilarious jokes along the lines of “oooo so you two are going to be tethered all night are you?” – It was like a really crap Larry Grayson had come back to haunt us. 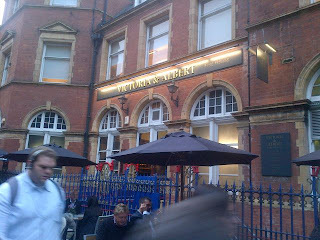 Anyway, escaping the every increasing noise of the Allsop Arms we walked back to Marylebone and the Victoria and Albert which sits in the very station building itself. As regular readers will know, I’ve now visited more than my fair share of station pubs and it’s very nice to be able to report that the V&A (as it’s known to friends) is yet again another very very good station pub. The V&A from the outside of the station. It is split into two parts and at first on the side where we’d entered there was only one hand pump serving Old Speckled Hen which may lead you to believe there wasn’t much of a beer selection, but eagle eyed Buddy Rob noticed that not only were there bottles of Bud in the fridge but also bottles of Duvel and Chimay Red. Charlie on the other hand had noticed the Meantime Pale Ale and it was with 5 pints of this (yes, and the bottle of Bud) that we retired into the other half of the bar to notice 4 other handpumps! The pints of Meantime came in a selection of Meantime glasses (see Golden Lion) and Stella Glasses (grrrr) but I’m still convinced there’s something about a stemmed glass which makes one behave in a more cultured fashion. 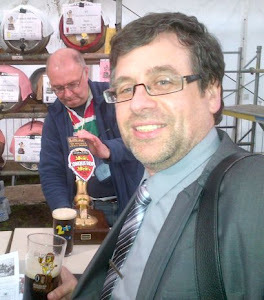 It was whilst our drinks were being poured that I asked the barmaid if she knew where the Cask Marque certificate was. “Oh yes” she replied “Just next door, on the wall” and sure enough, there it was! It was only after getting the scan (no need for Pete’s special tether this time) that I realised this was the first barmaid in the whole of the Monopoly Tour (so far) who knew what I was going on about when I’d mentioned Cask Marque – add to this the fact she looked like Velma from Scooby Doo – it was no wonder that I, and the rest of the scanners, all fell instantly in love with her! I mean how do you answer that? So I did it just like Nick Clegg would and lied……………. 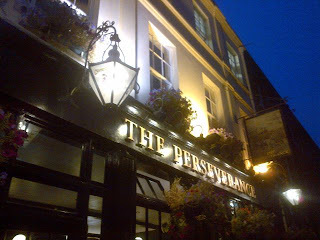 The final planned stop was the strangely named Perseverance in Shroton Street. This was a pub that Charlie had previously visited and he’d “bigged” it up all along the tour. When we’d got there it was something of a disappointment. Obviously a older traditional pub (big heavy Charrington lanterns hanging outside) it’s been stripped back to it’s minimalistic bare bones so all you’re left with is a circular bar in the middle of the room and a few tables and chairs. 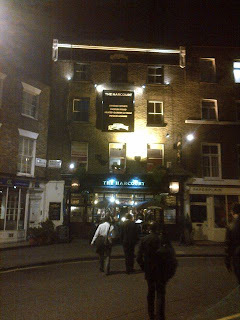 The outside was thronging with hoards of drinkers but the inside was almost deserted in a atmospherical vacuum. The service was delightful however, by surely someone who could have easily have been Miss Barmaid 2012 dressed in tight denim shorts and wellies (it works, try it. It works!) and the 5 pints of Doombar was perfectly served. 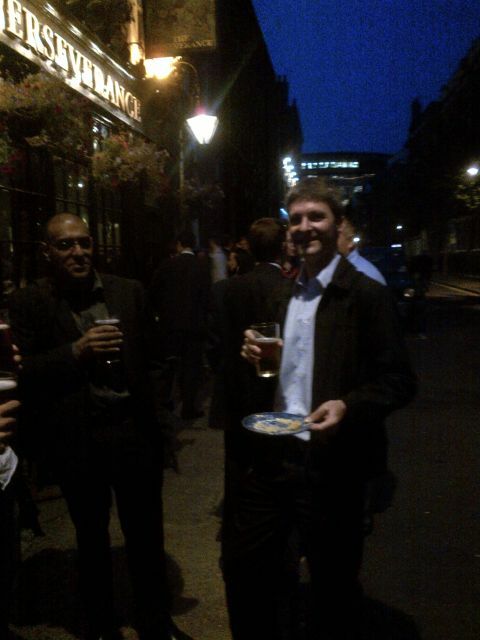 Unfortunately though Buddy Rob had to settle for a pint of Heineken (all tastes the same Rob, really it does). Detail of the Perseverance's Charrington Lanterns. Aussie Pete by this time was nearly in tears as he hadn’t managed to locate the certificate for the scan but a quick enquiry with the bar manageress had her scuttling up to the office to produce the certificate for us all to scan away to our heart’s content. We retired outside to the much jollier atmosphere and to toast Aussie Pete’s 25th scan when he appeared holding aloft a professional looking laptop bag. “Who left their bag inside?” he helpfully announced as we all looked at each other wondering why he’d just basically stolen someone’s computer. “Ah……I guess I’ll put it back then…” Yeah, probably a good idea, that’s personal bag advice there as PigeonJon might say. It may have been that the Perseverance was just too trendy for us old farts. We asked for crisps but got a handful of lattice shapes on a china plate, which although tasty wasnt what we were used to. Buddy Rob had to leave us then but there was just enough funds in the kitty to warrant a lightening quick sprint over the Marylebone Road into Harcourt Street and the aptly named Harcourt Arms, a very handsome looking end of street pub which a curious Swedish twist (it's true, they even say it on their Twitter account). Not only were there numerous adverts for the appalling Kopparberg Cider but there was also live streaming of league Ice Hockey. Luckily the Adnams Ghost Ship was tasting very English although the boys had now almost to a man slipped into lager mode. From there, after my chair had been stolen by an old chap whilst I was dashing to the loo, I made my excuses and left. For me this just left a nice short stroll back to Edgeware Road and one single Tube stop before Paddington and the train home. Upon entering work the following day I discover from New Guy Mickey that the remaining boys remained in the Harcourt for several hours longer. I hear that Charlie has changed his name to Johan Johansson, No Nickname Michael's favourite snack is rotting herring heads and Aussie Pete is working his passage to Stockholm aboard a fishing trawler. Is there no service that a pub won’t do now? = In the V&A you can have table service so you don’t need to leave your bags unattended. In the Allsop Arms they will serve you at the fruit machine! Are Wagon Wheels Paleo = ?